What is ACG San Francisco? ACG San Francisco is a non-profit organization that was founded in 1954. ACG stands for Association of Corporate Growth. The association was started with the aim of fostering a community that embraces corporate growthCorporate DevelopmentCorporate development is the group at a corporation responsible for strategic decisions to grow and restructure its business, establish strategic partnerships, engage in mergers & acquisitions (M&A), and/or achieve organizational excellence. Corp Dev also pursues opportunities that leverage the value of the company’s business platform. among its members. It enhances and promotes strategic networking, as well as international deal-making. ACG San Francisco is a group of professionals who play a critical role in corporate growth and development in mid-size and large companies. The association helps to increase the success of mid-market companiesMarket CapitalizationMarket Capitalization (Market Cap) is the most recent market value of a company’s outstanding shares. Market Cap is equal to the current share price multiplied by the number of shares outstanding. The investing community often uses the market capitalization value to rank companies by providing relevant information, capital, and connections needed for their growth. ACG members are made up of various professionals, executivesCEOA CEO, short for Chief Executive Officer, is the highest-ranking individual in a company or organization. The CEO is responsible for the overall success of an organization and for making top-level managerial decisions. Read a job description of corporations, leaders in financial companies and private equityCareer Guide to Private Equity JobsThis career guide to private equity jobs provides all the information you need to know - positions, salary, titles, skills, progression, and much more. Private equity firms are investment management companies that acquire private businesses by pooling capital provided from high net worth individuals (HNWI) and institutional investors., and professionals in both public and private organizations. They come together to identify resources that can help grow middle market companies and help them achieve their goals. They aim to grow middle market companies by providing innovation, technology and global investments. The association’s membership now stands at 14,500 members and over 90,000 investors with 55 chapters. ACG San Francisco is a team of professionals who bring about their leadership, mentorship and managerial experience to the team. New members will learn from leaders on how to manage a company and the people in a company to bring about the best teams. Young members, who are under 40 years old, are able to meet mentors from the team to enable them to become leaders in the future. ACG CapitalLink is a platform that provides financial information to members. Some 30% of ACG members provide capital to the association, 20% provide private equity, and the rest provide professionalism and corporate governance that are needed in the organization. ACG San Francisco offers mobile apps where members can access thousands of resources on capital and financial information. The traditional ways of accessing business loans and capital include bank loans or selling company shares and equity to create capital. Members of ACG can access capital streams from the association and its members. They also benefit from free financial advice from knowledgeable financial advisers through ACG CapitalLink. ACG San Francisco provides a platform where potential employers can meet with talented professionals. The job platform allows ACG members to expand their network. It benefits both employers – who may be seeking new talent – and potential employees – who may be looking for their next career opportunities and growth. The association keeps its members and investors updated with middle market growth business newsletters, trending news, and advertising opportunities through its published magazines and webinars. The magazines are mailed to members and investors every two weeks. The publication can also be accessed by non-members by logging in to their website and requesting it. Members can get an opportunity to advertise products through the magazine. ACG San Francisco aims to promote strategic networking and international deal flows among its members. Members can build new business connections and referrals through meeting professionals and leaders in the events organized by ACG and through communication. Members are also likely to meet potential business partners in the forums. About 40% of ACG San Francisco members are professionals in their respective fields. Some 15% of the members joined the association in the last ten years. Corporate development experts: Provide networking opportunities to executives in middle-level companies who want to grow their businesses. They do so through merger and acquisition strategies, and product development and promotions with the help of ACG programs. They also benefit from the international deal-making strategies initiated by ACG. Female leaders: ACG San Francisco offers a deal-making community for women to promote networking opportunities among female professionals from a variety of fields. They provide leadership, mentorship, and opportunities to share different experiences with women to help navigate the business environment as a woman. Family officers: Provides networking opportunities to people who want to grow their family or personal businesses. They offer career support, connections, and networking among peers who provide different business strategies and experiences. Young ACG: Provides networking environments for young members who are under the age of 40. The members are given the opportunity to meet other young professionals and make new connections. Young ACG represents the next generation of leaders and successful professionals. CEOs: PE-backed CEO’s who provide a networking opportunity to like-minded CEOs, managing directors, and other executives in various companies and businesses. The networking stream provides an exchange of ideas and the opportunity to learn new technology and emerging innovations that can help grow their companies. They also learn new market diversification from various companies to be able to handle business changes when they emerge. ACG San Francisco was established as a platform to benefit its members. Association members benefit by accessing potential opportunities that can help them grow their companies. 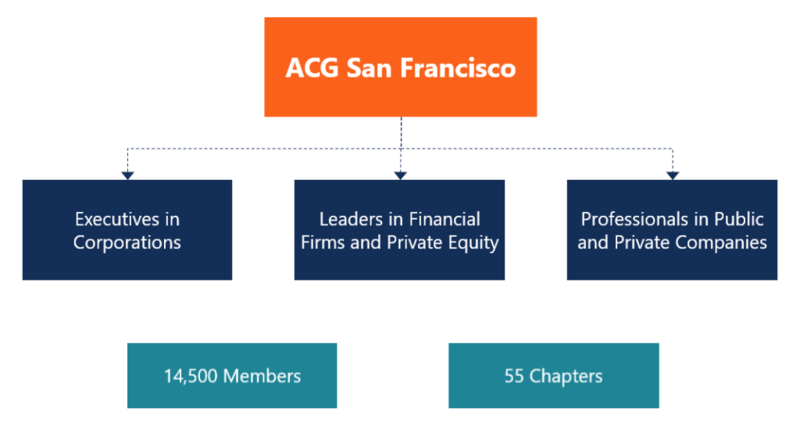 The ACG San Francisco platform is intended as a marketplace of business information from both high-ranking officers of companies and other members who provide expertise from various fields. ACG also intends for its members to take advantage of the knowledge of the latest technologies and innovative business ideas.